We supply 1200mm High Luminous Efficacy 50w Aluminum Alloy Wall Mount Bracket Mount ATEX Explosion Proof Linear Light with 5 years warranty on all the components. we devoted ourselves to explosion proof lighting for many years, covering most of European, Middle East and American markets. we are expecting to become your long-term partner in china. This Explosion Proof Linear Light is our latest model with simple appearance and robust structure. It is designed to provide reliable operation in the harsh environments. We have our own R & D team. They have over 10 years of experience in the lighting industry. All of our LED Explosion Proof Lights are manufactured and developed and patented independently by Shenzhen Cary Technology Co., Ltd. Our Industrial 50 Watt Linear LED lighting adopts high efficiency LED SMD chips. SMT technology keeps low working temperature of LED chips. It is made up of high quality aviation aluminum and impact-resistant PC. The housing with AL6063-T5 aluminum frame has excellent heat dissipation. PC lens can be anti-glare or clear for options.Compared with conventional lighting, it can offer longer life, enhanced energy efficiency, greater eco-friendliness, lower maintenance and better quality of light. This product is widely used in harsh and hazardous places, especially for environment with explosive gas and combustible dust. The rated power covers from 18 to 80W. 1. High efficiency SANAN LED, light efficiency up to 140 lumen/watt. 2. High quality aviation aluminum housing & impact-resistant PC lens, maximum efficacy, anti-glare. 3. Elegant design with robust structure. 4. Famous brand driver, over-temperature protection, high reliability, efficiency > 95%. 5. Energy-efficient technology - up to 80% energy savings over HID fixtures. 6. Versatile mounting options, easy installation. 7. Professional light distribution design, uniform and comfortable lighting. 10. 5 years warranty on all components. Our Explosion Proof Linear Light is suitable for areas with mounting heights of 2-7m. 1. Petroleum Industry, Crude Oil Treatment Industry, Metallurgical Industry, Power Generation Industry, Power Transmission Industry, Military Industry etc. 2. Where flammable vapors, gases, ignitable dusts, fibers or flyings may be present. 3. Explosive gas: Zone 1, Zone 2; Combustible dust: Zone 20, Zone 21, Zone 22. 4. Temperature class: T1 to T6. 5. Manufacturing plants, drilling rigs, petrochemical facilities, food and beverage facilities, oil tanks, workover platforms, production platforms, pumping stations, gasoline stations, transformer stations, coating plants, warehouses, loading docks, railway stations, tunnels, etc. 6. Locations requiring continuous and consistent light levels in extreme ambient temperatures. 7. Where extremely corrosive, wet, dusty, hot and/or cold conditions exist. 8. Classified and hazardous locations. Q1: What certification do you have for your LED Explosion Proof Lights? 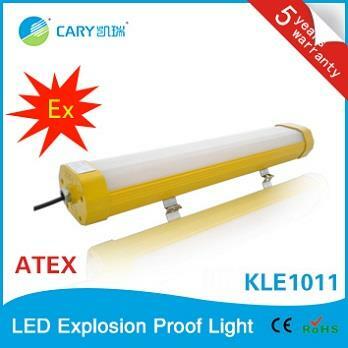 A: We have CE, ROHS, ATEX, UL, China Explosion proof approval for all of our LED Explosion Proof Lights. Q2: Can you introduce briefly for your LED Explosion Proof Lights? Are they unique or different from other suppliers'? A:Cary's LED Explosion Proof Lights are designed and patented independently by Shenzhen Cary technology Co., Ltd. We ensure quality by using famous brand LED chip, aluminum housing, PC lens and tempered glass. We ensure safety by strict testing and inspection. Yes. All of LED Explosion Proof Lights are unique, high-quality and safe. Q3: How long is your LED Explosion Proof Lights guaranteed? A: We provide 5 years warranty for our LED Explosion Proof Lights. Q4: Then your LED Explosion Proof Lights would be very expensive? A: They deserve high value. However, Cary will provide all customers with reasonable price based on your quantity. Q5: What's your MOQ? Can I buy one sample? A: Our MOQ for LED Explosion Proof Lights is 10pcs. Clients who want to buy 1-9pcs for quality test are also welcome. Q6: How do you ship the goods and how long does it take to arrive? A: We usually ship by DHL, UPS, FedEx or TNT. It usually takes 5-7 days to arrive. Airline and sea shipping also optional. Q7: How to proceed an order for LED Explosion Proof Light? Q8: Is it OK to print my logo on LED Explosion Proof Light product?